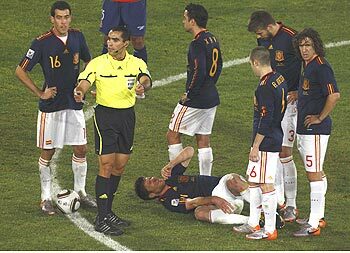 Spain midfielder Xabi Alonso [ ] is a serious doubt for the European champions' last-16 clash against neighbours Portugal after spraining an ankle in Friday's 2-1 win over Chile. Alonso, who has been in solid form alongside Sergio Busquets [ ] as one of coach Vicente del Bosque's two holding midfielders, went over on the ankle late in the first half and had to be replaced by Javi Martinez in the 73rd minute. "There are serious doubts over whether he (Alonso) can play on Tuesday," Del Bosque said on the Spanish soccer federation's website (www.rfef.es) on Saturday. "He is undergoing treatment and we'll see whether he is in good enough shape," he added. "If not, someone else will take his place." Victory over the Portuguese in Cape Town would set up a quarter-final against Paraguay or Japan [ ] and Del Bosque's side, one of the pre-tournament favourites, could meet either Argentina, Mexico, England [ ] or Germany [ ] in the last four. Del Bosque said he had full confidence in Martinez, who was a surprise inclusion in the squad, and predicted the 21-year-old had a long career ahead of him in the national side. "We have to gradually give him more experience and he'll be a very important player," the coach added. Del Bosque said after the win over Chile that he was concerned about Portugal's team as a whole and not just forward Cristiano Ronaldo [ ], adding he had been impressed by their performance in Friday's 0-0 draw with Group G winners Brazil [ ]. "No, I am concerned about Portugal," he said at a news conference when asked about Ronaldo, who plays with Spain internationals Iker Casillas [ ], Alonso, Sergio Ramos [ ], Raul Albiol and Alvaro Arbeloa [ ] at Real Madrid [ ]. "We saw today (Friday) how they controlled the Brazilians," Del Bosque added. "They were not prevented from playing their football and they counter-attacked. The fact that we got Portugal in the next round instead of Brazil is not a relief."